Does your app on google play store supports 64-bit architecture or in other words Is your Android App 64-bit compliant? If not, make sure it does because starting August 1, 2019, the apps published on Google Play will need to support 64-bit architectures along with 32-bit architecture. Since apps with 64-bit CPUs deliver fast, rich experiences to app users & will ensure users have the best experience possible on the Android platform. If your apps doesn’t support 64-bit architecture, its recommended to begin setting up the 64-bit requirement as soon as possible. Apps written in non-native code (e.g. the Java programming language or Kotlin) doesn’t need code changes. Note – There are no changes being made on policy on 32-bit support. Google Play will continue to deliver apps with 32-bit native code to 32-bit devices. The requirement means that those apps will need to have a 64-bit version as well. 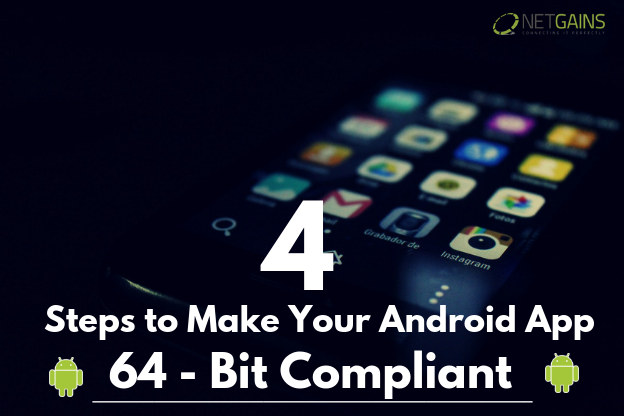 Follow these steps to check whether your android app is 64-bit compliant and how to get your app ready for 64-bit requirement. The very first step is to check whether you app is ready for 64-bit service or not. If your app uses only code written in the Java programming language or Kotlin, with any libraries or SDKs, your app is already ready for 64-bit devices. But, if your app uses any native code, or you aren’t sure if it does, assess your app and take the required action. – If your app uses any C/C++ (native) code. – Are there any links with third party native libraries. – Is built by a third-party app builder uses native libraries. – Check if your app uses 64-bit libraries. – Use APK Analyzer, a tool to evaluate various aspects of a built APK. Use it to find any native libraries, and ensure 64-bit libraries are present. The 64-bit version of the app should offer the same quality and feature set as the 32-bit version. So, make sure to test your app on the latest 64-bit devices which will thus allow users to a great experience in your app. When your app is ready, publish your 64-bit architecture supporting app as normal. Do follow the best practices for deploying your app. When rolling out an major update, cross check & make sure you have thoroughly tested your app on 64-bit-capable devices before publishing to a larger audience.